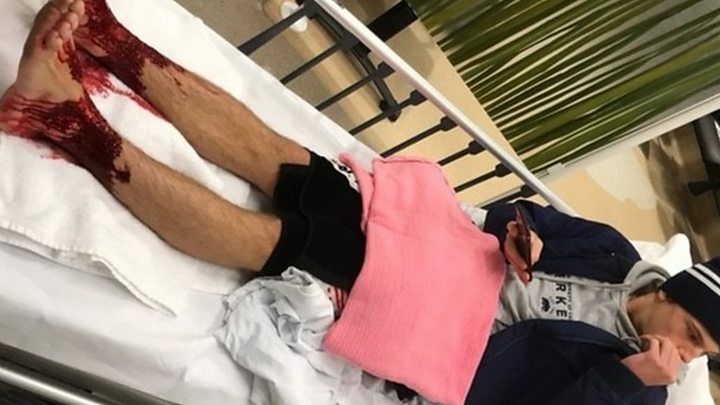 Speaking to the BBC's World Update radio show, Sam described feeling pins and needles in his legs after standing waist-deep in dark cold water for about half an hour. After shaking off what he thought was sand coated around his ankles, he walked across the beach before looking down and realising that his feet were "covered in blood". "It bled for ages, and it's still seeping blood now," he said. "It looked like a war injury... like a grenade attack. It was really bloody," his father told BBC News. Image caption "Sam is very positive," said his father.